Arif Baig could well be the strongest contender for the best cheerleader in the 12th Lok Sabha campaign. Walking through a crowded basti in Bhopal, the city's Congress candidate eggs on his supporters with energetic and rhythmic slogans. "Haath Chaap! Haath Chaap!" shouts the claque behind him. "Haath Chaap! Haath Chaap! echoes the coterie. "Sonia nahin yeh aandhi hai, aaj ki Indira Gandhi hai." "Oh, Arif Baig sometimes is a good orator himself," one resident in neighbouring Hoshangabad had remarked two days earlier. "I still remember his opening line in a speech many years ago -- 'Hamare mulk ke malik (Oh, owners of my nation)' he told the people at a rally -- It brought tears to my eyes." Dominated by Muslims, the four adjoining bastis are trucked in a corner, a short distance from the chief minister's home. Baig arrives there nearly 90 minutes late, and has to provide an explanation to an agitated elderly Muslim as soon as he steps down from his jeep. "Aap ko pura haq hai mujhe dantne ka, (You have every right to scold me)," he says as he holds the old man's hand. In his Congress bandi and white pyjama, Baig travels through the narrow lanes and bylanes -- over stinking drains and uneven cobblestones, waving at those who peek out of their houses. The bastiwallahs, mainly sabziwallahs, cyclewallahs, and goshtwallahs (butchers), are largely a discontented lot. Though very disapproving of their CM up the road, who they say has not done anything to improve conditions in their basti, most of them are willing to be kinder to Baig. "He is the only candidate who has come to our basti this time, we should vote for him," says Taj Mohammad. Other feel it is no use hoping for anything from the candidates -- even from Baig because MPs are a forgetful lot. The reason many in the basti are still willing to support him is only due to the goodwill one Congress corporator enjoys in the area. "the stagnant water in front of the nukkad dhaba shop;"
"Inshallah, if you make me win, I will take personal responsibility of this area," Baig pronounces with folded hands. For a man contesting his 11th election in a political career spanning three decades, Arif Baig is a humble campaigner. Smiling at children, leaping across little shop counters to pat someone, securing blessings from old women. Once, the only elected Muslim BJP member in the Lok Sabha, his major issue in this campaign is bhaichara (Hindu-Muslim unity). "This was the reason I left the BJP," he says. "You cannot rule a country by alienating your minorities." Bhopal's electorate has about 25 per cent -- some observers put it as high as 27 per cent -- Muslims, and it is this community that the Congress is clearly trying to win over before Sunday's election. 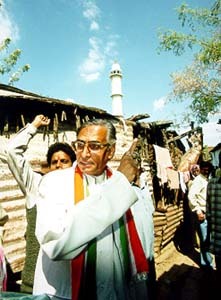 Part of this exercise involves inviting a former Congress MP named Rajesh Khanna to address a gathering at Iqbal Maidan, a Muslim enclave in old Bhopal. To attract a crowd, people are told that yesterday's superstar would arrive at 2000 hours. Three hours later, there is no sign of the man for whom such behaviour was commonplace at the apogee of his fame. I learn later that Khanna refused to address the meeting. And there hangs a story. Bhopal was apparently just a night halt for Khanna en route from another campaign meeting. Since local Congressmen announced his appearance at the Iqbal Maidan meeting without his consent, he refused to turn up. 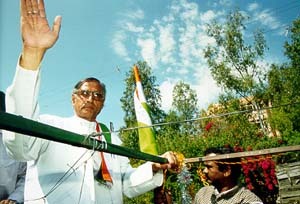 Even though he went past the venue, he ignored the entreaties made by Arif Baig and other Congress leaders. Even a call from Chief Minister Digvijay Singh failed to make Khanna change his mind. Eventually, Baig ate humble pie and told the restless audience that the former actor had hurt his ribs and could not make it to the ground. Many reckon that the BJP's Sushil Chandra Verma -- a former state chief secretary who has won the last three elections -- could make it four in a row. A local journalist feels it will be difficult for the Congress to breach the BJP bastion that Bhopal has become in recent years. "Here the polarisation between Hindus and Muslims in very visible," he says. Even as locals criticise the former IAS officer for his alienation from his constituents, they feel his party will see him through. As Girish, a courier agent, puts it, "In Bhopal even if a donkey stood on a BJP ticket, he would win." Arif Baig knows he has to prove this assumption wrong. This time, on a Congress ticket.